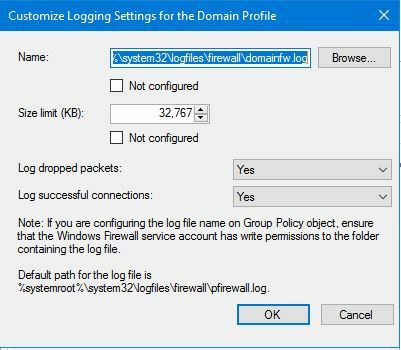 As part of Group Policy Management guidelines from the Centre of Internet Security (CIS), the recommendation is to turn on Firewall logging on all Windows Servers, and to save each profile to their own log file. Configuring this in Group Policy is pretty straight forward. Just type in the new file name for each profile, set the size, ensure we log dropped and successful connections and away you go. However… it seems that unless the log files have already been created the firewall service actually doesn’t log anything, nor does it log any errors! No, you don’t need to create the files. You need to grant Write access to ‘NT Service\MpsSvc’ to the folder (which needs to exist), so the service can create the file. Thank you very much for this post. I was also desperately stuck with this problem after following CIS guidelines until I read this post. In my case, MpsSvc had write permissions for the folder but logs were not getting created until Windows Firewall browse function. Thank you very much.